Chilliwack fire crews were at the scene of a blaze on Moody Ave. apparently caused when a smart meter exploded. uestions have risen over the safety of smart meters after reports that one exploded and caused a fire around 1 a.m. Tuesday, January 6 at a house in the 45000-block of Moody Ave. Firefighters responded and apparently cut into the wall where the meter was in order to access the fire which had crept into the wall of the home. It is believed that the Chilliwack Fire Department is still investigating this blaze, and so have yet to comment in a release. Stop Smart Meters, insists that fire departments and crews are under gag orders not to talk about smart meters or risk being fired. Are smart meters really safe? 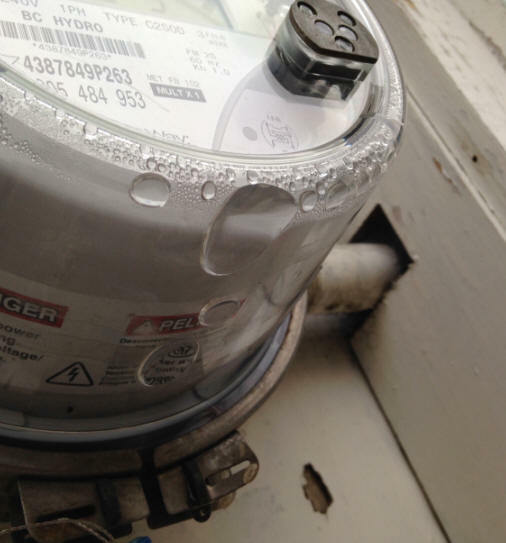 There are reports that water gets into some smart meters causing them to short out and catch fire or explode. It's unclear what kind of risk factors are involved with smart meters. For now, the best thing you can do is make sure that your smoke detectors work, that you're wired in with an alarm system, and have adequate fire insurance coverage. You can read more about what Stop Smart Meters has to say about the devices here. Above is a photo submitted by Lori Giesbrecht from StopSmartMeters of a smart meter with moisture inside indicating a possible hazard. Update: On Thursday, ESA issued a release saying Ontario Hydro has to replace a certain type of smart meter that is known to leak water. You can download and read that release here.